I suppose it's just the normal bane of being a 94 year old but her mental capacity is, shall we say, slipping. Now, sometimes, this is sort of amusing for us both. She'll say something that is totally off the wall and then we'll discuss what she thought she meant. Like, for example, the other night, she told me that the oxygen dudes were running around her room. Now, this would have been an interesting conversation if it hadn't been held at 2:30 am in her bedroom. So, I just put her back to bed and assured her that I had talked to the 'oxygen dudes' and they'd stay still. She was quite happy with that. We still have the occasional happy hour over here when friends drop by for a bit. 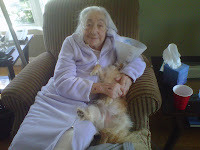 And, she still loves when the dogs are in her lap as she dozes in the chair. So, all in all, she's doing pretty good. 2. Poor Rita had to have emergency eye surgery last month. The right lens in her eye dislodged and moved to the front. She was in a lot of pain and, of course, it was a weekend (why is it ALWAYS a weekend?). Off we went to the emergency vet with a trip to a specialist opthalmologist on Monday for the surgery. 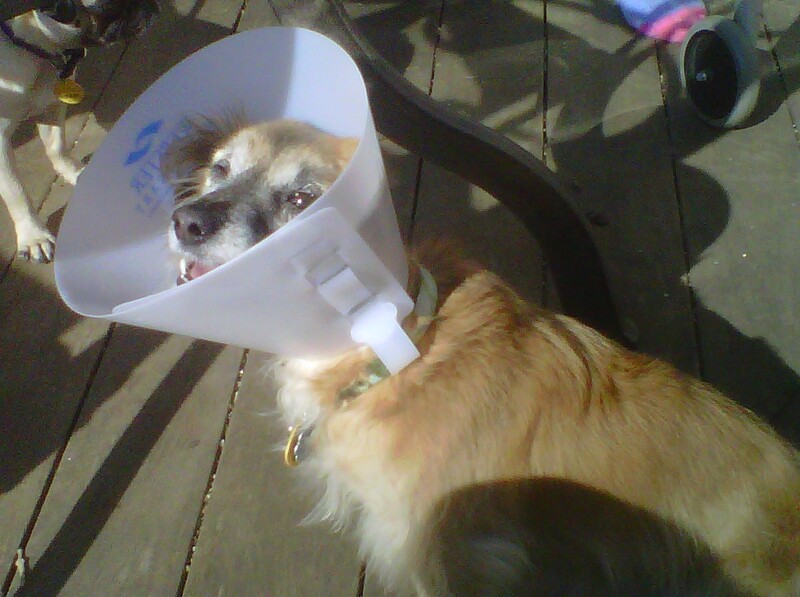 The poor thing was stuck in an e-collar for 12 days which was interesting. I got pretty good at figuring out how to help her adjust. So, we managed to keep her eye in her little head (although I did volunteer that it could come out....) but she's on drops for the rest of her life, 3 times a day. Well, she's still worth it. 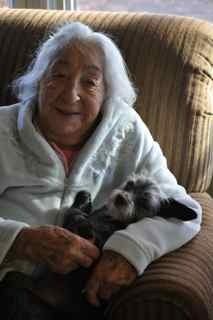 Mom was quite instrumental in Rita's recovery, holding her for hours a day as hey dozed in Mom's chair. And, Mom always reminded me when it was time for Rita's eye drops - it's interesting how Mom's mind works these days. I'd forget but she'd remember! Go figure. So, as you can see, I had reason to have been taking a rest. I have been cheating on this blog though with some other websites that I've been exploring, specifically Squidoo. This is a site where you build what they call 'lenses' which are actually itty bitty web pages. So far, I've made a huge 23 cent but, hey, you have to start somewhere. I remember the first day I made 3 cents at eHow - I'm over $200 a month on that site alone now. Not too shabby! Anyway, on Squidoo, we can put anything we like on a lens so I've been writing mostly about dogs. 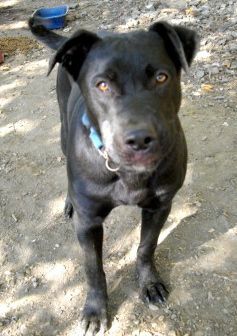 Annies Orphans Dog Rescue Of Maryland Introduces Hummer! That's him to the left. He looks to me to be a spectacular fella so if you know someone who needs someone to love, come meet him at the next adoption show. I, on the other hand, do NOT need someone else to love. 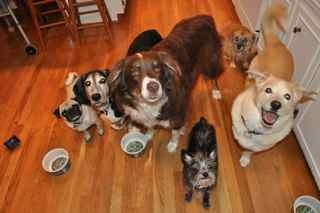 We're full at the inn with 6 dogs and a confused cat who was missing from the picture at the rights. I figure that I'll try to spotlight one dog a week for their dog adoption organization in the hopes of marketing a few of their dogs and finding them homes quicker. And, since John and I plan on retiring to Key West, we were going down there quite frequently. Here's a lens about Key West Tours. 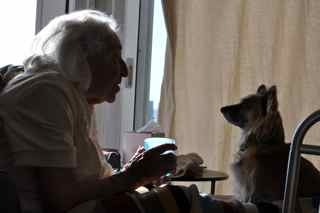 I also started a blog about Good Movies for Senior Citizens. John gave me an Apple TV so I could easily dial up Netflix for Mom. I've been searching for movies that she might like. Please give me some comments about any movies you think would be suitable. They have to be easy to follow! Ok, that's enough catching up at the moment. I'll try to be better - I swear! Mom got caught feeding a dog! Out and about - for once!